Are You Truly Prepared to Answer This: Why Should I Choose Your College? Pick any attribute and benefit that you communicate about your college and in all likelihood there are many other colleges that are saying exactly the same thing. Falling into this trap is essentially the same as stepping up to the plate and calling two strikes on yourself before the first pitch. You can’t differentiate your college in the hearts and minds of prospective students. To help colleges counteract this tendency, we use a video of Simon Sinek talking about “finding the why.” Sinek is a leadership authority, professor at Columbia University, and author whose philosophy is that people “don’t buy what you do, they buy why you do it.” In one of the most watched TED talks of all time, he suggests that people will buy from you if they sense that you believe what they believe. I highly recommend watching his video. Click here to see it now. Sinek’s video serves as a springboard for an in-depth discussion of the importance of framing your institution’s value in a way that resonates with what the prospective student believes and finds important in a college. Unfortunately, we have discovered that many colleges don’t truly know what they believe in. They may understand and articulate the attributes of their institution. They can give you many good reasons why they think they are the best college for you. But they have never gone though the process of distilling all of their special qualities into a single belief – an overarching value proposition that the student will immediately find meaningful and compelling. Please trust me that I didn’t insert all of this just to plug Longmire and Company. If you don’t know us, and I just tell you WHAT we do, it has no context. And it’s probably boring. But if I first tell you WHY we do what we do, it gives meaning to the products and services we have. And if you believe – like we do – that having richer conversations with your prospective students will lead to greater enrollment, then you’re most likely to trust that we can help you. Once prospective students know what you believe and why you do what you do, all of the features and benefits that you present will have context and greater meaning. They will carry greater weight. They will be more compelling. And even though your individual attributes may be similar to that of other institutions, the student will perceive them as being different because you have delivered them in a context that makes you unique. 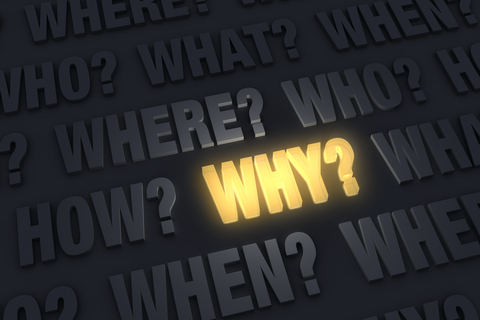 First you have to find your “why.” Then, you must articulate it clearly and concisely. Finally, you must be able to translate it into how you serve students. We’ve helped many colleges do this while we’re on campuses conducting our Interactive Training Workshops. Since our workshops are completely customized, we often include activities for the sole purpose of defining “WHY.” Recently, we had the opportunity to conduct a workshop that included not only admission counselors and staff but also coaches, faculty, financial aid counselors, and members of the bursar’s office. The workshop included a breakout session of small groups who were challenged to complete the following sentence, “At [the college’s name] we believe….” The rules of this exercise mandated that they discuss it as a group and arrive at a mutually agreeable statement that reflected the underlying belief of the college and how that belief gets translated into serving students in ways that are unique. The results were nothing short of amazing. This diverse group of individuals, representing nearly every branch of the college, ultimately adopted a singular statement that all thought accurately represented the central belief of the institution. Moreover, they were able to share many examples of how their now-defined “WHY” can provide greater weight and meaning to their features and benefits statements. Now, instead of simply saying they are a small college that delivers highly personalized service, they are now saying, “At [the college name], we believe that students deserve…and as a small college, we deliver on that belief by….” Their clearer understanding of who they are, and what they fundamentally deliver to students, helps them articulate how they are extraordinary in the sea of choices available to prospective students. That clarity naturally infuses itself in every conversation they now have with prospective students. We’ve been on many campuses over the years conducting workshops and I can tell you that the vast majority of the colleges we’ve worked with have a deeply-rooted sense of who they are, and how they are different. They just don’t know how to articulate it precisely. Continue the conversation on Twitter @LongmireCo. For more information about Longmire and Company’s Interactive Counselor Training Program, click here. Be sure to Subscribe to Versions of Conversion today so you don’t miss any of this highly-valuable information. In our most recent nationally co-sponsored study, The Excitement Factor!, 12,000 college-bound students shared insights with us about the ways colleges made them feel welcomed and wanted. We uncovered a number of surprises that underscore opportunities for colleges to differentiate themselves and build a stronger bond with the students you are recruiting. The most shocking discovery came when we asked students if the colleges they were considering had taken a personal interest in them at any point in the recruiting process. Two-thirds said “No” or “Don’t Remember” and in our view “Don’t remember” is the same as “No.” (You can DOWNLOAD the full report now.) Those who did experience personal interest from colleges were very specific in recalling who, what and how that interest was conveyed and how it laid the foundation for a relationship with the college that would lead to their enrollment. You already know that many students are persuaded to attend a particular college because of friends or family members. 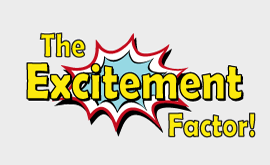 As a matter of fact, nearly 40% of students participating in The Excitement Factor! study told us that their college choice was influenced by where a parent or sibling attended. But, we also discovered other outside influencers you need to know. Students described interactions with student teachers at their junior and senior high schools, faculty and staff members they met at various summer camps and academic competitions, and even shopkeepers at local stores as individuals who played a significant role in their college selection. 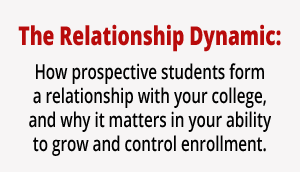 Successful admission professionals know that creating a connection with a student can greatly increase his or her commitment to the college and improve the likelihood of enrollment. They know that building a relationship and continually strengthening a bond is crucial. We will be exploring this subject in great detail in our next national co-sponsored study, “The Relationship Dynamic: How prospective students form a relationship with your college, and why it matters in your ability to grow and control enrollment.” Join a consortium of some of the most highly-respected colleges and universities in the country to find out how YOUR OWN pool of prospective students have or have not formed a relationship with you. Co-sponsors find our studies valuable because of the wealth of information they gain– information they can use to drive action and change. For detailed information, colleges can download detailed information about the study by CLICKING HERE. I have a confession to make: As a former enrollment management guy, I love the college admissions game. Even after more than 20 years of an often grueling schedule, sleepless nights and, sometimes, unreasonable demands, I still believe that it is one of the most fulfilling and exhilarating professions you can choose. Today, I am a teacher and that is also a very gratifying profession. I still follow higher ed closely, periodically advise colleges, and write about this ever-changing industry. Mark Thompson: Longmire and Company has been serving higher-education for over 25 years and, since 2009, conducting these co-sponsored studies that always seem to discover something new about the industry and prospective students. I know that many colleges participate in these studies year after year and the findings get widely reported. What makes them so popular? Bob Longmire: We actually started doing the co-sponsored studies to meet a need in the industry that just wasn’t being addressed. There are issues and hot topics that constantly emerge in higher education recruitment and marketing, and professionals in the industry need to stay on top of them. They want to know how these issues will impact the industry as well as their own college. They want information that will help them identify opportunities to differentiate themselves in the higher ed marketplace. It can be very expensive for an individual college or university to do the scope of research needed to get the answers and insight we get. But by co-sponsoring with other institutions they get the best of both worlds: data and insight about their pool of prospective students coupled with a national picture, getting a very comprehensive study for a tiny fraction of what it would cost to do it on their own. As I recall, the concept for your just-concluded study, “The Excitement Factor!” was sparked by a discovery you made in a prior study. What was the genesis of this new study, “The Relationship Dynamic”? The launch of the “Relationship” study was sparked by a key finding in the “Excitement Factor” study. We found that a student’s excitement about attending a college – and their ultimate enrollment – is driven, in large part, on the connections they make with current students, professors, admission counselors, tour guides, coaches and others on and off campus. We were able to measure how complex and powerful relationship-building is in student recruitment. Now, we want to put on our sales and marketing hats and drill down into how relationships get cultivated through personal interaction, mass communication, social networking and so on. College admissions professionals already know how important it is to build a relationship with prospective students, what will they learn from this study that is new to them? We all know that a student’s college selection is tied closely to the strength of the relationship they build with a college over time. And we know that creating relationships is a multifaceted, nuanced and crucial part of student recruitment. But the real question college admissions teams want answered is, “What can we do to create powerful relationships with our prospective students in all aspects of our recruitment efforts? What methods create the strongest bonds? Is it social media, personal contact with admissions counselors, professors, other students, high school counselors, or something else entirely? And, how can we involve all influencers, on or off campus, in the development of rich relationships with our prospective students?” We intend to answer those questions and more in this study. There is so much research already out there in the world of higher ed. How is this different? There is no doubt that as an industry we capture a lot of data about students and how they select colleges and what influences them. What differentiates our studies is their focus on the emotional factors that drive college selection. Facts tell but emotions sell. The other factor that distinguishes all of our co-sponsored studies is our focus on providing highly actionable-data that colleges can use immediately. There is “nice-to-know” data that provides context and there is “need-to-know” data that drives action. We get need-to-know data that’s going to change a college’s approach, process, and bottom-line. Four-year, not-for-profit public and private universities and two-year community colleges from across the country. All shapes and sizes. We are bringing colleges on board with this study now! How does a college participate as a co-sponsor? Just call us. It’s really easy. The co-sponsoring college doesn’t have to do much other than provide us with data on the students they want to include. We take it from there. For detailed information, colleges can download detailed information about the study by CLICKING HERE. Trouble playing video? Click here. Continue the conversation on Twitter @LongmireCo. Be sure to Subscribe to Versions of Conversion today so you don’t miss any of this highly-valuable information. You can reach Bob Longmire at (913) 492-1265, ext 709 or at blongmire@longmire-co.com. Connect with Bob at Linkedin/in/boblongmire. Mark Thompson is a seasoned and highly-successful higher education professional who has held positions in enrollment management at large and small, public and private institutions including The Ohio State University, Thiel College, Defiance College and other institutions. He follows and writes about developments in the field of higher education enrollment management. He can be reached at (419) 789-1637 or markthompson412@gmail. A recent story by Beckie Supiano in The Chronicle for Higher Education, “Students’ College Choices Aren’t Totally Rational (and That’s OK),” included insights from our most recent nationally co-sponsored study, The Excitement Factor!. Supiano writes, “For many students, choosing where to go to college is, at least in part, an emotional decision. That’s not one more higher-education problem to be solved. It might even be a good thing.” In interviews with industry professionals including college and high school counselors, Supiano reports on the influence of the emotional connection, often referred to as the “AHA!” moment, for a student making his or her college choice. The answer is: Take a personal interest in the prospective student. If you are thinking that is too simple, or that most colleges do this already, two-thirds of prospective students will disagree with you. In truth, most college-bound students say that the colleges they most seriously considered never took a personal interest in them at any point in the recruiting process. Student excitement about a college is enhanced when they perceive that the college has taken a sincere personal interest in them. And, as a practical matter, the more personal interest you take in a student the more you will find out about his or her unique combination of interests, preferences, desires, anxieties, and aspirations. With that greater understanding you will naturally communicate a unique value proposition. The student will perceive you as unique among their available choices. You will have reached the coveted state of differentiation. For a significant percentage of students who reached the application or admit stages of the funnel, the college’s personal interest in them, or lack of it, was influential in their college selection decision. With 36% to 42% of students in the public and private pools, respectively, saying that this was influential in their college selection, it underscores the opportunity for colleges to impact enrollment by demonstrating a personal interest in students across every brand touch point of the institution. Best Practices: How personal interest is exhibited by the college. 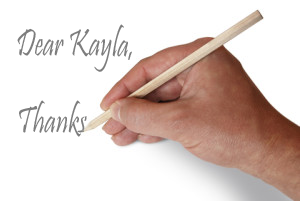 Students respond very favorably to highly personalized, well-crafted emails that address their individual interests. Any type of communication that appears to be genuinely targeted to the individual student is likely to be well received, interpreted as personal and stands out from other colleges. Many students relayed stories of colleges building relationships with them in their sophomore and junior years of high school. They said that personalized individual attention exhibited by the college makes them feel more confident, more important, more wanted, more recognized, and more excited about attending. There are communication techniques your staff can learn that will help them feel confident about reaching out to their prospective students to ask the right questions. This is one of the core techniques we teach in the Interactive Counselor Training Workshops we hold on college campuses throughout the country. It is also a key component of YES, our Yield Enhancement Tool. Relationship building isn’t the role of the admissions office alone. Students told us that they responded to personal attention exhibited across all brand touch points on campus; from admissions, to faculty, to financial aid, to anyone who comes into contact with a prospective student, even the landscaper who is helpful in providing directions to a student visiting campus for the first time. The release of The Excitement Factor! is creating a great deal of thought-provoking discussion among enrollment managers and higher education marketing professionals. The project uncovered a wealth of highly valuable information on how your ability to create student excitement about your college can drive your enrollment. You can DOWNLOAD the report now.